Hello Couchers! Welcome to the 97th edition of Tuesday Couch Potatoes where we post about our favorite movie each week. Apologies for my late TCP entry. I was in pain yesterday due to a terrible toothache but I am feeling better now. This week we go sporty and active as we feature films about sports, with the theme "It's All About the Game". We are competitive in nature and we do enjoy a good sports film once in a while. So, without further ado, here's my pick: The Mighty Ducks. I was still in my grade school years when this came out in 1992 and seriously, I enjoyed this movie when I got to see it in my teenage years on TV. I remember even having a crush on Joshua Jackson, one of the players of the Ducks team, who is of course more popularly known as Pacey Withers of Dawsons's Creek if you are one of those who grew up in my time. This movie shows that we all have our potentials and if we believe in ourselves, we can achieve the things that we want to achieve. It also teaches us what teamwork is all about. Thank you all for joining us this week on Tuesday Couch Potatoes my dears! And yes, I am still pushing with my plan for the small giveaway. I still need to finish up the mechanics and the banner. I hope I can manage to post it within the week. And oh, next week's theme: "Insanity and Delution", movies where the main character has extreme paranoia, having multiple personalities or are beginning to lose their minds. Let's see if you are brave enough to explore this type of movie next week. Have a good week and a Happy TCP y'all! OH! For me it was Luis Mendoza! lol. 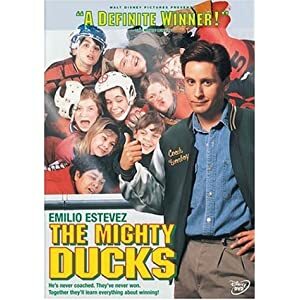 Love all those 3 Mighty Ducks movies. OMG! We picked the same movie. I guess the saying is true then, Great minds think alike. How Do You Tell Time?